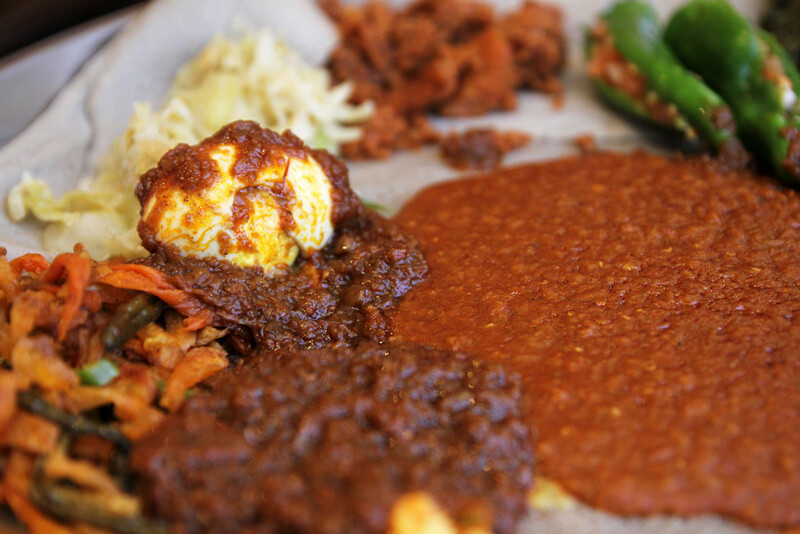 Ethiopian food is one of the most exciting cuisines in the world. Not only is the food extremely unique and extraordinarily flavorful, but the food culture that makes up Ethiopia is also something I found truly fascinating. To begin with, Ethiopian food is eaten with friends and family. Even the way Ethiopian food is served, on a communal platter, is designed for sharing food with each other. 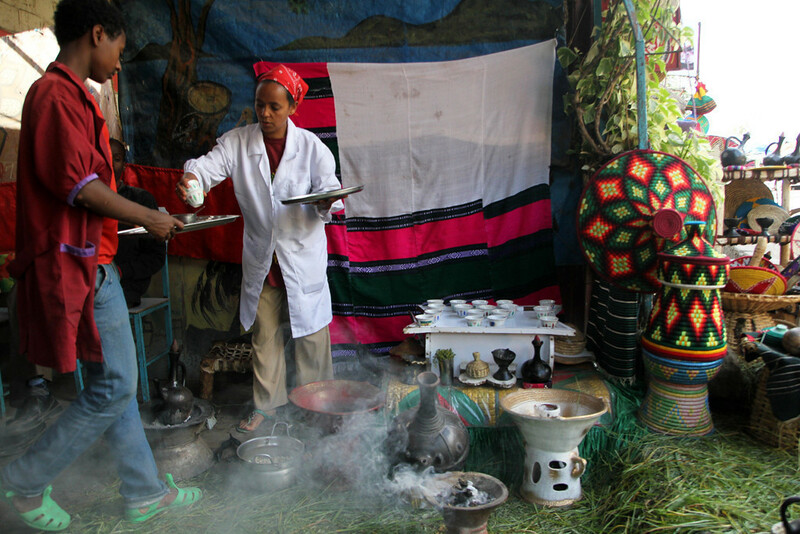 Food is not meant to be eaten alone in the culture of Ethiopia. In fact, during my visit, I can’t say I ate off a traditional plate my entire time. One thing I learned, by seeing it happen numerous times watching local Ethiopians eat, is that feeding someone a bite of food is seen as a very respectable or loving thing to do. I often saw couples tearing off pieces of injera, scooping up the best bites of delicious stew, and proceeding to feed it to their loved ones, a practice I soon learned is called gursha. Taking the time to feed your loved one, or a friend you really care about, that just has to be one of the greatest culinary traditions that still exists today, anywhere. How to eat Ethiopian food? 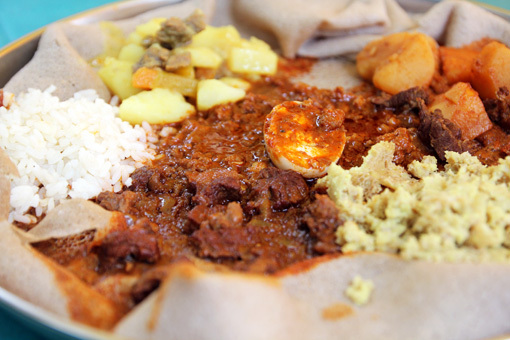 The very first thing you need to know about Ethiopian food is something called injera. Injera is the staple and the most widely consumed starch / filler in all of Ethiopian cuisine; Most Ethiopians eat it injera, twice, or even three times a day. It’s the foundation of Ethiopian food. What is injera? 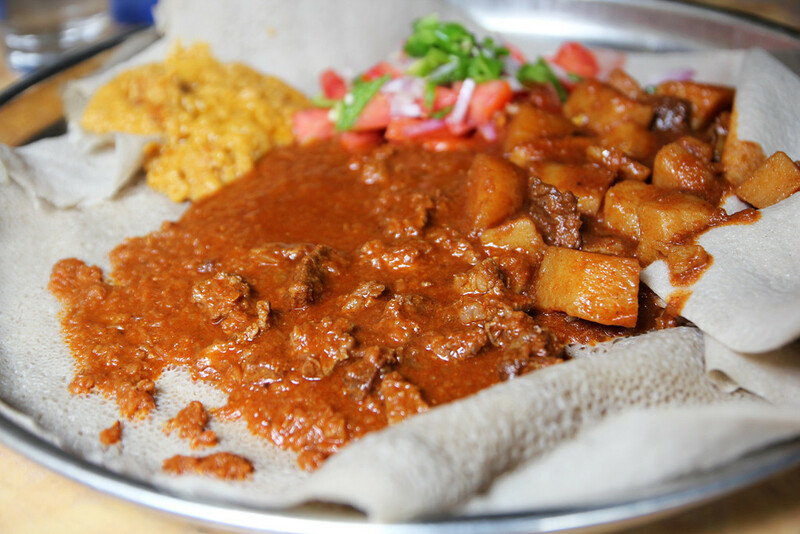 Injera is made from a grain known as teff, which is ground into flour, made into a batter, slightly fermented, and then fried on a heavy skillet into a giant circular pancake. The texture is soft and spongy and the flavor is lightly sour. When you go to an Ethiopian restaurant in Ethiopia, you order the dish, or mix of dishes that you’d like, and injera automatically comes with it – you don’t need to order it separately. 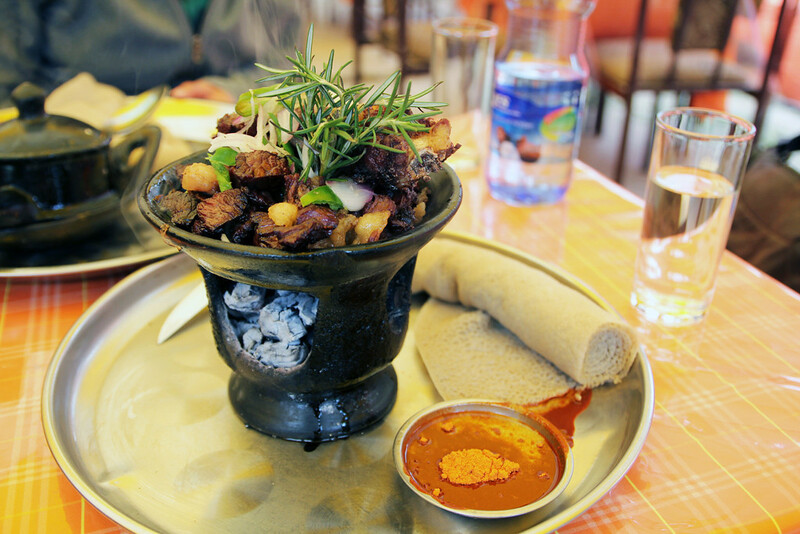 Food in Ethiopia is served on a platter known as a gebeta, a large circular, usually metal platter. 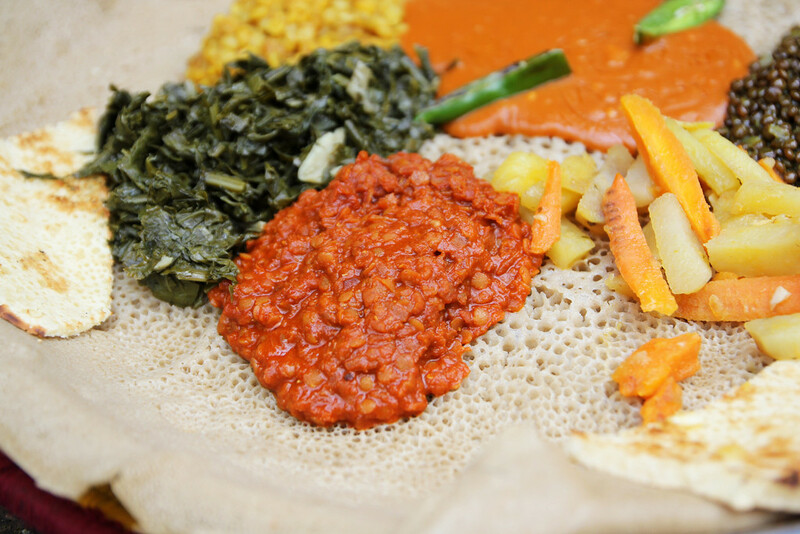 First, a circle of injera is placed on the gebeta, then the different stews, curries, or vegetables, that you’ve ordered are placed on top of the injera. 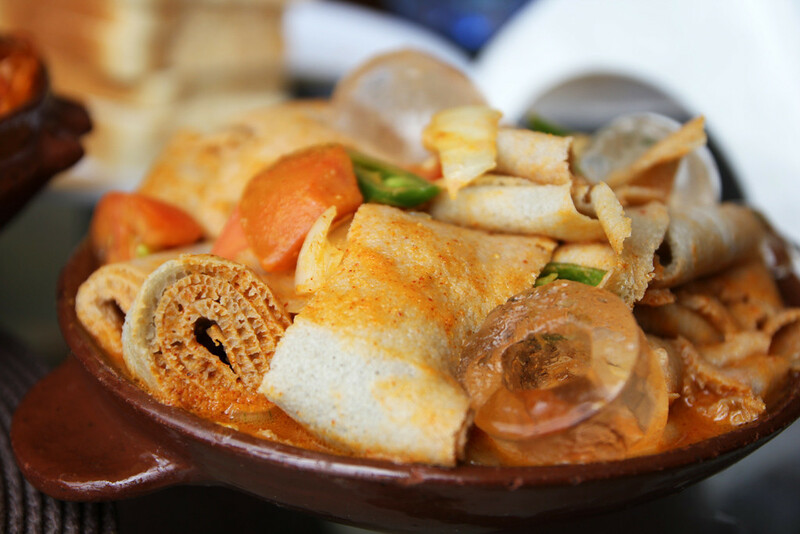 From a single dish to a mix of different dishes, everything is piled onto the plate of injera. 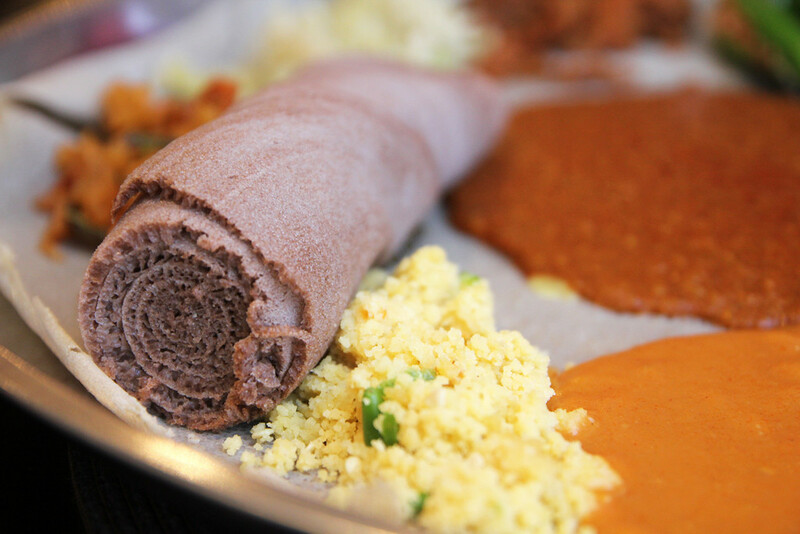 Depending on the restaurant, you might also get some extra rolls of injera (like in the photo pictured above) to begin eating with first, or alternatively you can immediately begin tearing off pieces of injera from the edges of the large main piece. To begin eating, first tear off a bite sized piece of injera with your right hand. Then use it to scoop up, and pick up a bite of your choice of whatever you have on your platter. As you begin to eat your dishes, you can begin to eat the foundation piece of injera at the bottom, and I think it’s the best part of the meal, because it’s had time to soak up all the wonderful flavors of the dishes. No utensils are needed, you eat with your hands, while sharing a single platter of food with everyone you eat with. Eating meals in Ethiopia is absolutely an amazing experience! Ethiopian food is well flavored with a mixture of different spices and herbs, not extremely spicy in heat, but rather very well seasoned. The staple injera, mentioned above, is sour, and it goes well with the legume spicy riddled stews. Berbere – Berbere is the masala of Ethiopian cooking, it’s a mixture of different spices that forms the backbone of flavor for many dishes. Chili powder, fenugreek, ginger, garlic, cardamom, cinnamon, and whole bunch of other spices are combined to make berbere. It’s essential in cooking Ethiopian food. Mitmita – Mitmita is another similar blend of dry spices, but it’s often salty, and can either be used in cooking, or served as a side seasoning for meat. I especially like it with tibs (roasted meat). 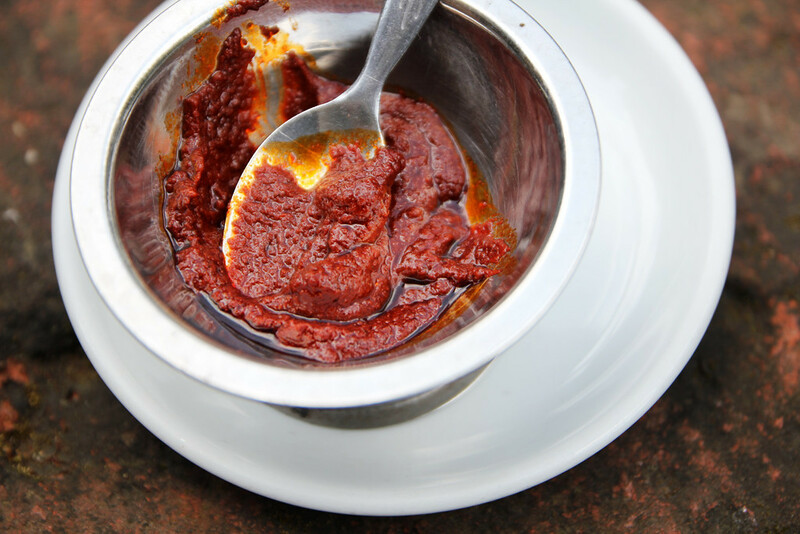 Awaze – Awaze is the paste version of berbere. You actually get some berbere dry seasoning and mix it with oil (often olive oil), and a bit of Ethiopian wine or whiskey. It goes very well with meat dishes. Niter kibbeh – Another highly important ingredient is niter kibbeh, or just Ethiopian butter. The clarified butter is brewed with some spices like fenugreek, cumin, and turmeric, so it has a lovely flavor to it. Basically if you’re not eating vegan Ethiopian food, your dishes will likely include some niter kibbeh in them. These are a few of the main seasonings and spices that make Ethiopian food so incredibly flavorful. That’s me, about to eat a vegetarian feast! If you are planning to travel to Ethiopia and you’re vegetarian or vegan, you’re going to thoroughly enjoy yourself. I would definitely say, that if I ever had to become vegetarian, I would either live in India or Ethiopia. Every Wednesday and Friday, as well as during the lent period each year for those who follow the Ethiopian Orthodox faith, are known as fasting days. Now, this doesn’t mean not eating, it just means not eating anything that comes form an animal, or in other words only vegan food. For the most part, when I was traveling in Ethiopia, I would eat vegan food on Wednesdays and Fridays as its commonly available at nearly all restaurants. It’s also quite common to find vegan food throughout the week as well, but you’ll find it widely available on those two days. 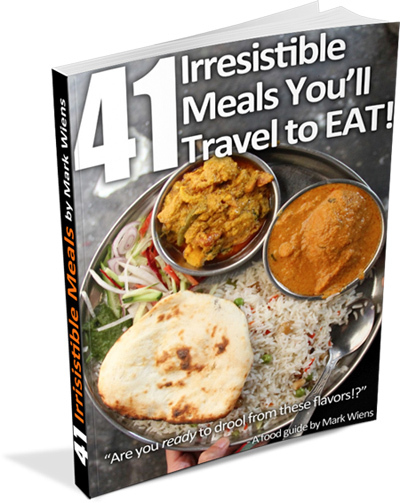 Also, be sure to check out my article on vegetarian Ethiopian food for more information. 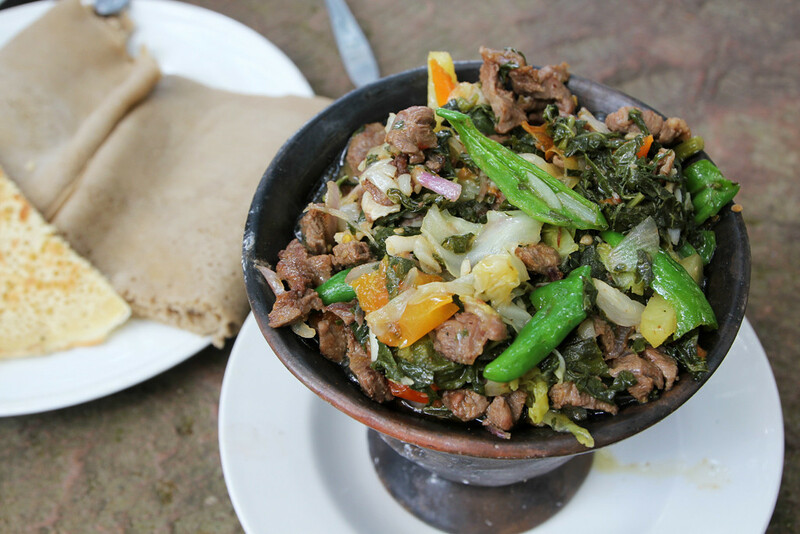 There are plenty of wonderful dishes and variations of each dish to eat in Ethiopia, but here are ten dishes that I personally found to be widely available and extremely delicious. When you travel to Ethiopia, don’t miss these foods. 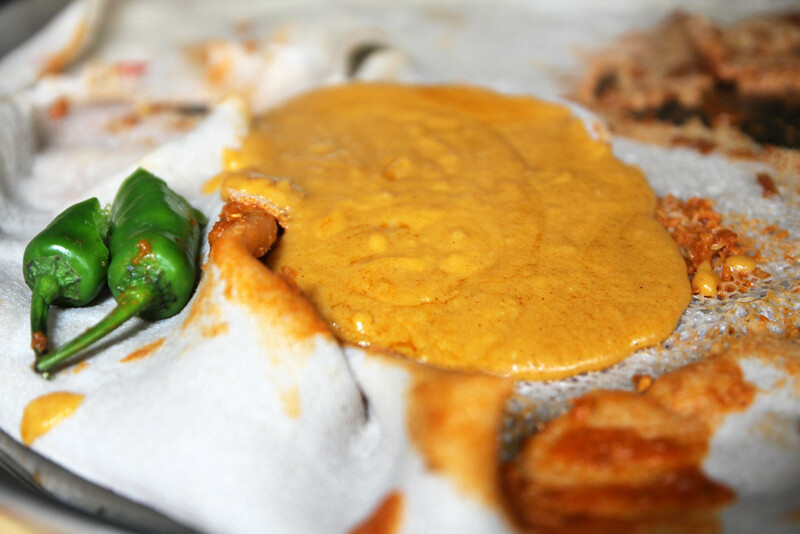 Along with injera, shiro wat, also just called just shiro, is one of the most widely consumed dishes in Ethiopia. If you ever order a mixed combination platter of food (like yetsom beyaynetu), or if you eat vegetarian food, shiro wat will nearly always be among the selection. Shiro wat is made from chickpea and broad bean flour, mixed with garlic and onions, and made into a thick, almost paste like substance. Kind of like refried beans but smoother. Non-vegetarian versions of shiro often includes lots of butter, but the vegan version usually includes a little olive oil instead. I absolutely love shiro wat, especially like the version I ate multiple times at Grand restaurant in Addis Ababa, where it was infused with lots of garlic. Another staple for the vegetarian repertoire of Ethiopian dishes is misir wat, or red lentil stew. The lentils are cooked with a few spoons of berbere spice powder to give them a nice redness in color, and cooked until tender, yet they still have some texture to them. When I was in Ethiopia, I ate misir wat at many restaurants, and every time, it tasted just slightly different. Could be due to the amount of spices they used, or how long they cooked it, sometimes the texture was smoother and sometimes more whole lentils. It was always good, but always a little different. Believe it or not, salad proved to be one of my favorite dishes in Ethiopia, especially the timatim salata, or tomato salad. The tomatoes were always fresh and crisp, with so much flavor to them. The tomatoes were diced, mixed with some onions and chilies, and seasoned with salt, lemon juice, and a drizzle of olive oil. I think it was both the fresh flavorful vegetables paired with the injera, and sort of mixing up each bite with another curry, and that contrast of the tomato lemony salad that made it taste so good. 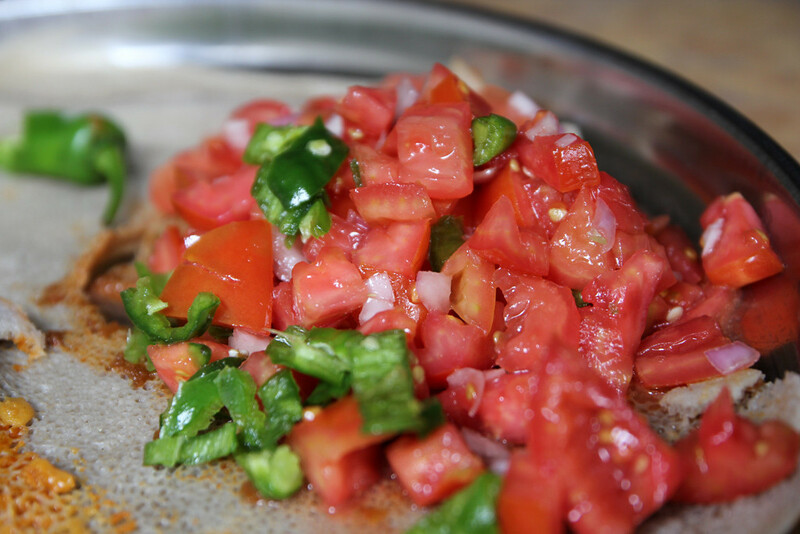 I ate tomato salad at many restaurants while traveling in Ethiopia and never had stomach problems. There aren’t too many Ethiopian breakfast dish varieties available, but one of the common things to eat in the morning, or even for lunch, is chechebsa, made from kita bread. For myself, I actually normally preferred a slab of injera and some meat curry for breakfast, but chechebsa was also quite tasty from time to time. Imagine a paratha (a flaky oily fried bread) shredded into bite sizes pieces, then fried up with some butter and just a hint of berbere for flavoring. When I ate chechebsa in Ethiopia, it was served with a side of fresh honey and a bowl of plain yogurt. The contrast of the oily spicy doughy bread with sweet honey and yogurt was unique and flavorful. Fit fit or fir fir is normally made with leftover or day old injera, mixed with leftover stew, such as shiro wat. The injera is torn into small bite sizes rolls or pieces, marinated in the leftover stew of the day, and left in the fridge overnight. The injera pieces in fit fit or fir fir become really moist and fall apart, quite sour, and also very juicy. The sponginess of the injera soaks up a lot of liquid. It’s served cool, sometimes even with ice cubes in it. It’s definitely an interesting dish to try in the Ethiopia food list, and at first it didn’t look all that appealing, but once I tasted it, I really enjoyed it! One of the great Ethiopian foods is doro wat, or chicken stew. When I first tried Ethiopian food, back when I was living in Nairobi, when I was about 12 years old, I think my first bite was doro wat. I’ve been in love with it ever since. Using the omnipresent mixture of berbere spices, a heavy load of Ethiopian butter, chicken, eggs, and onions, doro wat is born. The sauce is mostly made from onions that have been stewed down for so long, they disintegrate into a puree. The chicken comes dripping with juices and the egg is caked in flavor. The best doro wat I had was at Kategna restaurant in Addis Ababa. Key wat is a fantastic Ethiopian beef stew. The meat is usually cut into tiny cubes, then stewed with a generous amount of red berbere seasoning, some extra cumin, fenugreek, onions, garlic, and a bit of tomato puree to make the sauce. The meat and sauce combination of key wat makes for the perfect dish to mop up all the flavorful sauces and juices. The bottom of the injera, at the end of your meal, is always packed with flavor. Gomen is a popular vegetarian dish, mostly just collard green fried up with some butter. It’s really good as a vegetarian dish, but even better when it’s mixed with some extra garlic, diced pieces of beef, and some extra vegetables, known as gomen be siga – and it’s no longer vegetarian. It’s not always served in a hot clay vessel, but it sometimes is, and it was really delicious the time I got it. You can either spoon out scoops of collard greens and beef onto a piece of injera, or you can dig right into the bowl. 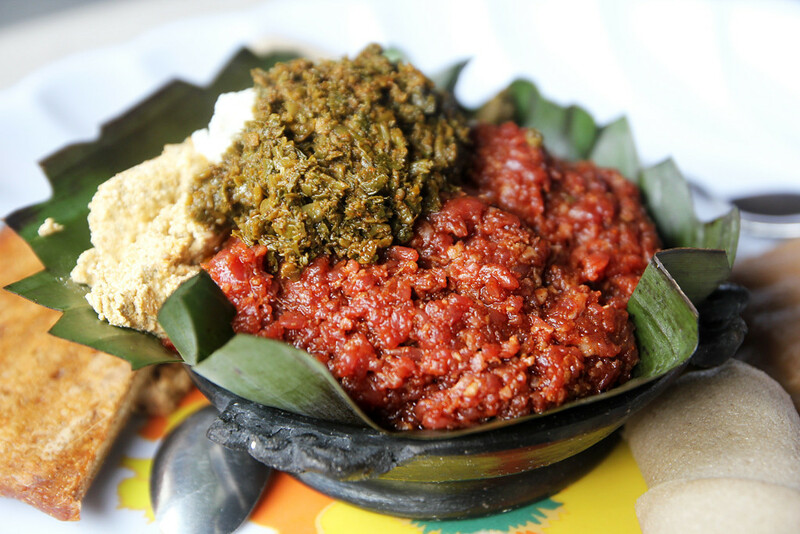 Kitfo, a dish made from raw minced beef, is one of the most beloved local dishes in the entire country. It’s a food that’s often eaten on special occasions, with good friends or family. You can either order leb leb, which is very slightly cooked, or the normal kitfo which is completely raw. The minced meat is mixed with mitmita, a blend of spices, and niter kibbeh, the Ethiopian herbed butter, and that’s it. The meat is served with injera, and at a nicer restaurant I also got a bread called kocho. Despite there being plenty of vegetarian food available in Ethiopia, if you’re a meat lover, many Ethiopians are also in love with meat. 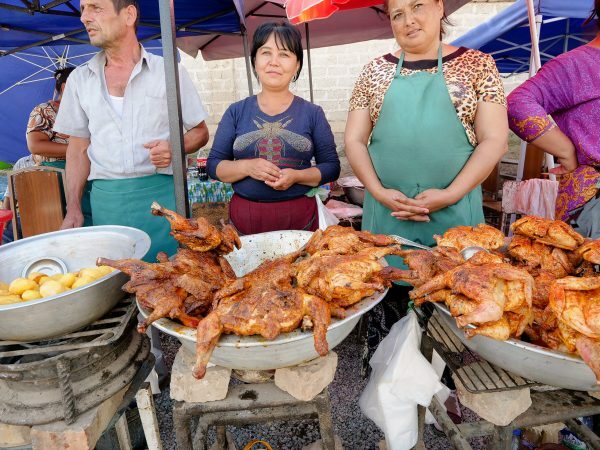 Walking along the streets of Addis Ababa, you’ll get whiffs of freshly butchered meat, hanging in the open air butchery ready to be sliced off and served by the chunk. Step into a butcher and you can order a straight up hunk of raw beef served with a dipping sauce, but I especially liked roasted meat, known as derek tibs. 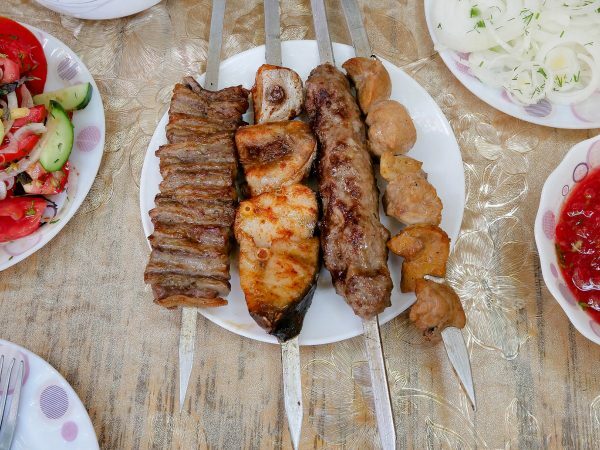 You can normally choose between beef or goat, and the meat is sliced up into pieces, fried with butter, and served inside a flaming hot ceramic dish. Derek tibs is sometimes also seasoned with rosemary and garlic, and served with awaze, a chili dipping sauce on the side, and rolls of injera. If you love meat you’ll love derek tibs. Finally, I just wanted to mention that Ethiopian food is especially wonderful when you get to eat a mixture of different dishes in one meal or on one platter. So I often ordered either a mahaberawi, which is normally a mixed platter including meat dishes, or the yetsom beyaynetu, which is a mix of different vegetarian dishes. 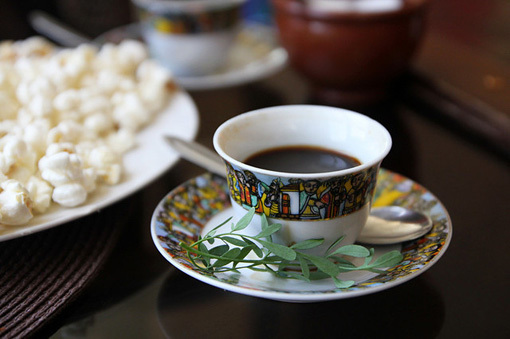 If you love coffee, you already know that Ethiopia is the birthplace of this wonderful beverage. When I was in Ethiopia, I could not get over how delicious the coffee was and hot readily available it was as well. Buna is the traditional Ethiopian style of coffee, prepared in a clay pot known as a jebena, and served in small espresso cups. Other types of European style coffees, like macchiatos, are also commonly available at restaurants and coffee shops. I liked every kind of coffee in Ethiopia, but one of my favorite memories was stepping into a hole-in-the-wall coffee shop where a lady was roasting beans, grinding the coffee, and brewing it fresh. You’ll find local Ethiopian coffee all over the place. I normally don’t intake too many drinks, for no better reason than I like to eat and fill up on meals rather than beverages. 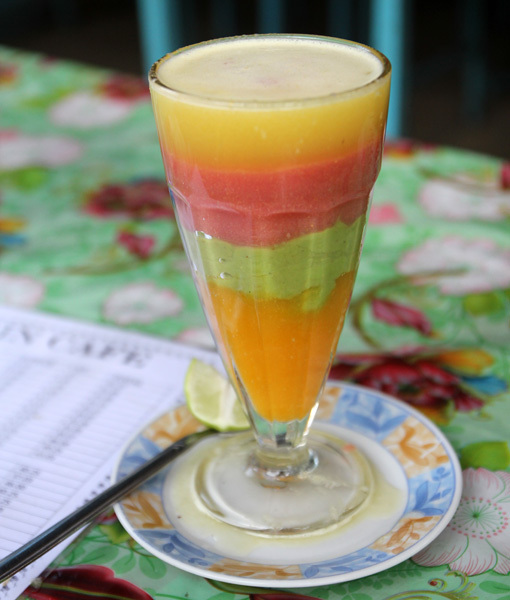 But in Ethiopia, I could not resist myself from the amazing juices, which are actually more like thick smoothies. Pure avocado juice, or the mixed fruit which came layered with different blended fruits, were my favorites. What I really liked about Ethiopian juices, is that they used only a hint of sugar (or no sugar if you asked). Can’t beat an Ethiopian avocado juice! Watch all my Ethiopia videos here. Ethiopian food is growing in popularity outside of Ethiopia, especially in the United States where I’ve eaten it numerous times, and even there are a couple of Ethiopian restaurants in Bangkok. I had an incredible time in Ethiopia, and really enjoyed tasting this amazing complex and culturally significant cuisine. Have you ever had Ethiopian food? Leave a comment below! Thanks for this clear and succinct intro—I’m introducing friends to it and your piece is a great reminder. I’ve loved habesha food (especially door wat) since I first tried it 40 years ago. Ethiopian food is an excellent choice for vegans. I love Misir, Shiro and Gomen is my most favorite. I cook it at least once a month and order teff Injera online from Fassica.com. I had Ethiopian food for a recent part and it was a hit even for those who never tried it before. I am having trouble finding an updated tipping guideline for being in Ethiopia. Perhaps someone here could be kind enough to share the expectations? Thanks! Hi Mark, I am UW student taking a class about food and culture for my nursing class. One of my assignment was to find a food blog. and critique. Looking Ethiopian food blog I found yours. 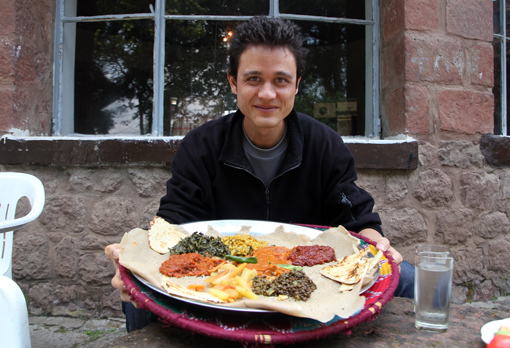 It is interesting to read from someone from other culture to fall in love of Ethiopian food. I had Ethiopian food for the first time my brother in law who is from Ethiopia introduced us to the food it was Amazing! I thoroughly enjoyed it and found it very different to anything I’d eaten before. It was incredibly filling though!! I also enjoyed an ethiopian coffee afterwards, which was excellent. The owners were lovely and took the time to explain to me and my friend how to eat the dish and what the different ingredients were. I’m thinking of flying to Addis Ababa and staying there a few days before heading to Lalibela. It looks like travelling around the counry can be tricky – did you take internal flights? Any plans to go back to Ethiopia yourself one day? Sorry but I was in Addis Ababa for 1.5 months and I can’t find the Ethiopian food delightful! The sponges in injera is not appetizing to look or eat. It’s usually served cold and sour. The Sauce that come with it is as not appetizing either. It’s usually this powder mixed with chopped bunch of onions and they can’t even say what’s all the spices on the powder mix . I don’t find Ethiopian food delicious at all. I lose weight being there bec there’s nothing to eat that is great! Ethiopian food is amazing !! There’s a lot of Ethiopians in Washington D.C so I was blessed to eat in different Ethiopians Cuisines everyday . i was absolutely obsessed with it , as a matter of fact I still am , lol. Hey Inez, great to hear you love Ethiopian food so much. Glad you can get delicious Ethiopian food in DC! Mark, thank you for sharing. 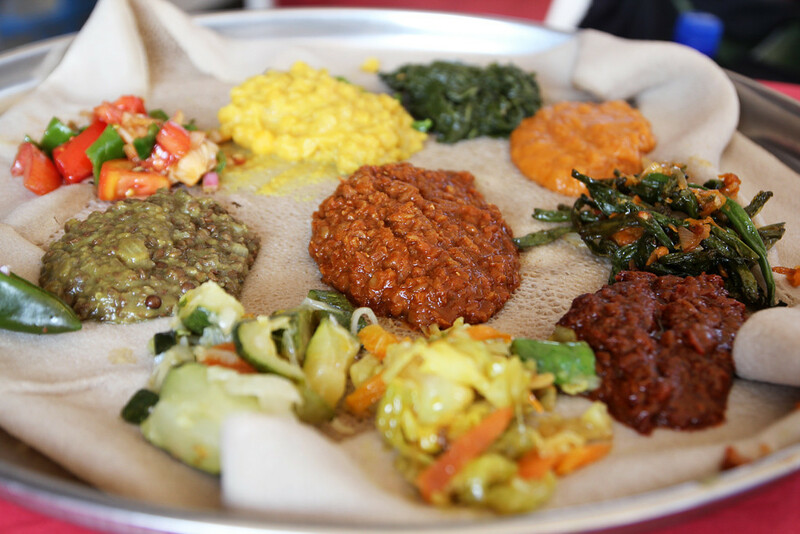 This is a great post and very informational, specially for those people who has not tried Ethiopian food. Cooking Ethiopian food at home is fun and I encourage everyone to try it out. Thank you very much Fassica. 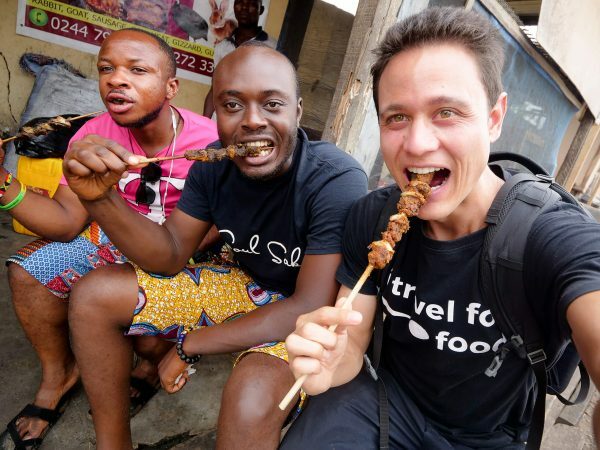 Hi, I write for an online food publication called Spoon University and I was wondering if I could have permission to borrow the photo at the top of this article for one of my articles on vegetarian food around the world. I would of course give your photography credit if given permission. Excellent presentation my friend. I worked in Ethiopia about twenty years ago and I have fallen in love with Ethiopian food ever since. When I returned to the States, it was so depressing that the closest Ethiopian restaurant was about 200 miles away from where I lived at the time. Now I live in Washington DC, this city is a heaven for variety of Ethiopian restaurant. My favorite one is “Habesha” around 9th and U, this place is nothing fancy but it’s the closest that you can get quality wise to the real deal. Their Kitfo is consistent and the veggie combination is out of this world. Thank you for educating people who are not familiar with Ethiopian dishes and for mouth watering pictures. Hey Mark, good to hear from you, so glad you love Ethiopian food as well. I think when I was in DC a few years agao I went to Habesha and had the kitfo, I remember it being fantastic. Thanks for sharing your restaurant recommendation! Hats off for your very good videos and I like your down to earth approach and the way you enjoy each and every meal, be it from the streets or high flying hotels. God Bless you .Cheers. Thanks…looks like great dishes….i should taste them some day! Thank you very much for the very well done job. Your video is really fantastic. I am Ethiopian living abroad. I really missed this for quite sometime. photo for Kitfo, is missing. you get that staff in the file. it really is wonderful. the photos and the video in particular made me think of flying to Ethiopia soon. Hello Daniel, great to hear from you, thank you for your kind words. Ethiopian food is one of my favorite cuisines in the world, I’m getting hungry just thinking about it now. Hope you can visit soon! I don’t know from where to begin Ameseginalhu “Thank You” I am from Ethiopia a country once known for famine and now seeing our national dish getting popular at global stage because of people like you make me feel just wow. Next time you come to Ethiopia I will learn how to take cool food pictures. Hi Abel, sorry for the late reply, and thank you very much for your encouraging words. Glad to hear you’re from Ethiopia, I think it’s an amazing country with one of the most amazing food cultures, and amazing people in the world. Thank you again. Thanks for this nice introduction. I have gone twice to a restaurant,in Addis Ababa and today a friend and I went to 2000 Habesha (I think that is right spelling). It was a bit overwhelming as the ingera covered an entire platter. Seemed better for a large party. We had a chicken and beef stew (I think they are described in your photos above) along with a plate of fried rice. Very nice flavours but a bit spicy (had to use several tissues because it affected my nose). We couldn’t finish everything. I am curious about the vegetarian dishes and the idea of that Lent platter sounds like it would be a good introduction. I think I will pass on raw meat. Thanks again, your site was a real gift. Hi, great to hear from you, glad that you’re in Ethiopia. How long will you be staying there? Yes, those platters of food, and the mixture of different dishes, are truly the joy of eating Ethiopian food. The fasting days (vegetarian) are Wednesday and Friday, and you’ll find plenty of restaurants that serve it. Hope you’r enjoying your time there. Fitfit and Firfir are slightly different in that the first is more wet but Firfir more dry and mainstream. we in Ethiopia use some of our finest Injera loaves to prepare these [rather than a way to be economic and consume left-overs]. This is to say the two are as main and concrete as the rest are in Ethiopian food line. There are quite a lot of Ethiopian breakfast meals. The whole Firfir family (kita firfir, injera firfir, dabo firfir, tibs firfir, qwanta firfir, sega firfir ….) are basically breakfasts here along with Genfo, Kinche, Rooz and others. additionally egg is used in many different ways. I think you were looking for a breakfast which is plainly used all over Ethiopia, the thing is each Ethiopian society has peculiar breakfast dishes apart from these making us more options. Kocho literally always follows Kitfo. You order Kitfo (big restaurant or a meal corner) and you can be silent about Kocho, still it follows it. Btw, Kocho is very interesting story – it takes months to finally come up with those loaves you saw. Perhaps, if you haven’t made anything on Kocho, I hope you will find it so wooowing – the way the Guraghe Ethiopia people do it. Well, Ethiopia is a nation of over 80 different tribes – that means 80 d/t culture, language, tradition, feasts and importantly foods. So when you say Ethiopian food, you mean the ones which are invented in any of these societies and stood out to shine to the others. (which only the few are able to attain). In Addis you can find them, but if you go around, you won’t be able to list them out. Hey Eddie, wow, thank you so much for all your additional information and tips. Eating in Ethiopia was one of the highlights of my eating life so far, so many amazing things to try, and such a rich culture of food. I would love to travel around Ethiopia more in the future to try more regional delicacies. Thanks for the explanation about fitfit and firfir. Thinking about Ethiopian food now, I’m getting really hungry. Looking to find gebetas(Ethiopian serving platters) So far I’ve had no luck Could you direct me to someone or company that sells them? Hmm, I’m not sure, hopefully someone else can help. I am an Ethiopian and saw your vid on youtube and read the above post. Your pronunciation of the dishes astounded me too. Showed it to my friends. They all loved it as well. We believe food is for sharing. Almost no one eats alone. A whole family or friends eat together. Growing up in Ethiopia, i used to take packed lunch to school and my friends and i used to combine all our packed lunches and eat together. I now live in the west, tho i eat alone, i do get to eat Ethiopian food 2 or 3 times a week. I feel there is a lot the west can learn from us being one of the oldest civilizations on earth. We get a lot of bad press and our name is always related to hunger due to 1984 and years of bad politics. Because of people like you, we are now known for something good other than hunger. Some people joke and say they did not know there was food in Ethiopia. Some listen to the jazz music we played in the 1960’s and 70’s and say Ethiopian??? Look deeper and its a land of surprises. Thank you my friend and may God bless you even more! Hello Samson, thank you very much for watching my video and for leaving a comment. I want to first tell you that Ethiopia stands out to me as one of the most amazing countries, with food and culture and people, that I have ever visited, I really enjoyed it. Yes, the communal eating and the respect for each other while eating, is remarkable. Where are you living now? Do you return to Ethiopia to visit often? Hey Pedro, thank you for reading and I hope you can visit Ethiopia soon! I love that there are so many dips, spreads, sauces involved in their dishes. Hey Stephanie, yes I agree with you! Boom! Epic photography Mark 🙂 The ‘Awaze’ sauce looks like a bit of a stinger! Ha. Are you a veggie convert now?! Thank you Steve, no not a converts… but I sure don’t mind eating vegetarian meals sometimes! I am quite literally drooling all over my desk after reading this. I travelled extensively in Ethiopia 3 years ago and fell completely and utterly, head over heels in love with Ethiopian food! It really is truly unique and incredible delicious. Simply having injera and shiro for breakfast- the most simple of Ethiopian staples- would make my day. 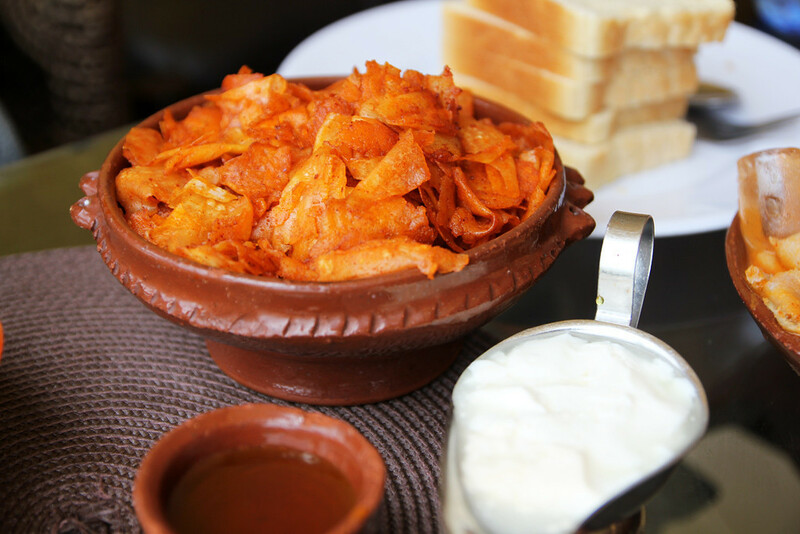 I have written a number of great posts about travelling in Ethiopia but could never find the right way to express my love for this interesting cuisine, but you have done it amazingly! Thank you! Now I need to try and find somewhere in South Korea that sells Ethiopian food… it might be a long shot! Hey Jade, very cool to hear from you, glad you had such an incredible time in Ethiopia and loved the food as well. Are there any Ethiopian restaurants in Seoul? There are a couple now in Bangkok! I love this post! Great job Mark. But it’s killing me to look at this delicious food. After reading this post I immediately searched for Ethiopian restaurants in my city and looked at some menus. Derek Tibs for $24USD!! I need to go to Africa for the real thing. Thank you very much Paul, you could also make some tibs yourself, but yah I know you would enjoy traveling in Ethiopia! Mark, could you persuade a chef to show us how to make some of the vegetarian and meat wat dishes? I’m a scientific editor, but I volunteer at a community center, cooking for a few hundred people at times. Hopefully, I could pick up some new cooking techniques and learn what goes into the magical spice blends that make Ethiopian food so amazing. Hey Barry, thanks for checking out this guide, sounds like a very interesting job you have! Have you done some searching on YouTube? There are some good recipes there to get you started, and if I can put together any recipes in the future, will do so. Thanks! I’ve had some bad experience with Ethiopia food but I’m starting to think I should give it another shot now. Great read as usual. Hope you can give it another try! I’m just drooling at your pictures! Truly amazing food. (except the raw stuff….) I wish to get a taste of Ethiopian food. You know at first I thought that injera is tripe… it just looks like it!! But I’m glad it isn’t! And that smoothie/fruit juice, I really have to make some! It’s looking delicious. I’m actually fasting right now and need some good vegetarian dishes that I can try when I have come off the fast and you just gave me quite a lot of good ideas, thanks! Ha, yes injera could definitely look a little like tripe. I didn’t like the thought that much of an avocado shake (I always like avocado more as savoury), but after having them in Ethiopia, I loved them! Thank you for checking it out Madusanka!